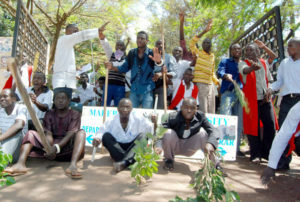 Makerere University students during a past demonstration. The students have joined the demonstration against the lifting of the Presidential age limit. Courtesy photo. KAMPALA–Makerere University students are engaging in running battles with the Police after they were blocked from holding a procession to Parliament. Students had wanted to petition the Speaker of Parliament Rebecca Kadaga over the bill seeking to lift the age limit to allow President Museveni vie for the Presidency after clocking 75 years. By press time, about four students had been arrested as they were getting out of the main gate. They are now detained at Wandegeya Police Station. In areas near the university, Police officers are using teargas to disperse the student protestors who are in turn pelting police with stones. Police have also sealed Forum for Democratic Change (FDC) offices, anticipating the members of the leading opposition party to conduct demonstrations against lifting the age limit. Police officers have camped outside the party offices in Najjanankumbi along Entebbe Road and are not allowing anybody to access the premises. Alice Alaso, the acting party president, had announced on Monday this week that the party was to organize demonstrations across the country. Other political parties yesterday joined FDC to fight the age limit project. Meanwhile, KCCA councillors who had also planned to march to the Constitutional Square are holed up at City Hall while their boss, the Lord Mayor Erias Lukwago is detained at Kira Division Police Station. The Inspector General of Police, Gen Kale Kayihura, yesterday evening made it clear that there will be no processions either in favour or against the proposed removal of the presidential age limit. Kayihura claims that he received notifications by different groups intending to hold processions in the city and other parts of the country. In Gulu district, some anti- age limit demonstrators were seen burning tryes and holding placards.